Volkswagen has confirmed the pricing for the eight-generation Passat saloon and estate. Deliveries will begin in January 2015, with prices starting from £22,215 for the saloon and £23,745 for the estate. There will be no petrol engines will be available at the launch, which means the entry-level Passat saloon is £1840 more expensive than the outgoing model, while the new estate is £2005 extra. 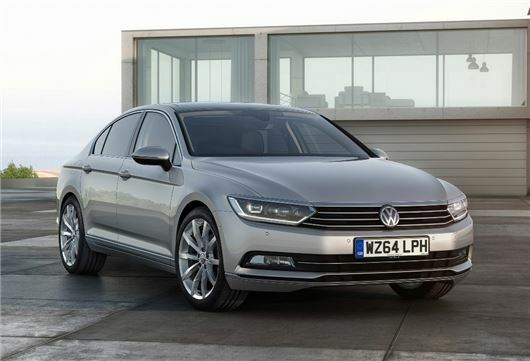 However, Volkswagen promises a raft of significant improvements, with a new longer wheelbase and enhancements in interior space with more legroom and head room along with a bigger boot for both the saloon and estate. Saloon versions offer 586-litres of boot space - 21 litres more than before - while the estate gets 650 litres, which is almost 50 litres more than before. The engine range will feature improved versions of the TDI diesels, but there will be no standalone petrol engines for the UK. The line-up starts with the 120PS 1.6-litre through to two 2.0-litre units with 150PS or 190PS. The range-topping 2.0-litre bi-turbo will boast 240PS and an impressive 500Nm of torque, with a new seven-speed wet clutch DSG automatic gearbox and 4Motion four-wheel drive. A plug-in hybrid GTE version with a 1.4-litre TSI petrol engine and electric motor will follow in October 2015. A BlueMotion with a 1.6-litre diesel engine will join the range in June 2015, returning a claimed 78mpg and 95g/km of CO2. Emissions for the rest of the range will start from 103/km in the saloon and climb to 140g/km for the 2.0 BiTDI DSG. At launch, five trim levels will be offered - S, SE, SE Business, GT and R-Line - and all will get post-collision braking systems and mis-fuelling prevention. SE models get adaptive cruise control, Ergo Comfort seats and front and rear parking sensors, while touchscreen navigation will be fitted to SE Business trim. Heated Alcantara seats, three-zone climate control and 18-inch wheels will be standard on GT trim, while the range-topping R-Line adds bespoke design features, such as bodykit, xenon headlights, touchscreen DAB radio system and sports suspension.